To Cite: Rezaei F, Kaka G, Sadraie S H, Jalali H. Effects of Bone Marrow Stromal Cell Transplantation on Repair of Bone Defect in Rats, Trauma Mon. 2018 ; 23(2):e13701. doi: 10.5812/traumamon.13701. Background: Mesenchymal stem cells are one type of adult stem cells, which are able to give rise to mesodermal origin tissues. The application of mesenchymal stem cells for tissue and organ regeneration offer advantages because of the relative ease of collection and their potential to differentiate to 3 cell lineages. Objectives: This research was designed to study and evaluate the effect of mesenchymal stem cells on the repair of bone defects in Wistar rat models and to compare autologous and non-autologous cell transplantation in repairing bone defects. Methods: The mesenchymal stem cells were cultured and expanded in MEM medium supplemented with 10% fetal bovine serum (FBS) and 2% penicillin/streptomycin by incubation at 37°C in 5% CO2. Immunocytochemistry analysis was performed using CD44 and fibronectin markers to detect the mesenchymal stem cells. A transcortical defect was created within the distal epiphyses of the femur bone. After 3 days of injury, Brdu-labeled cells were injected at the site of injury. The animals were sacrificed after 4 weeks of transplantation and the femurs with the recipient area were removed and the length, weight, area, density, and biomechanical parameters were evaluated. Results: The obtained results showed that although neither non-autologous nor autologous cell transplantation significantly improved the effect on length and area of the defective femur bone, the mass and bone density of the cell-injected transplanted groups had a significant increase in comparison with the control and sham groups. Conclusion: It seems that cell transplantation could improve these parameters, improving the mean mass, length, area, and density of parameters during the the regeneration process. Bone regeneration is a process that has common features with embryonic development of the skeleton and involves molecular pathways mediating chondrogenesis and osteogenesis during fetal development (1, 2). Different strategies have been defined to promote bone healing, which rely on cells that can participate in bone regeneration process through cell contacts, growth factors, cytokines, and extracellular matrix proteins, creating micro domains or niches and regulating self-renewal and differentiation (3, 4). Bone marrow-derived mesenchymal stem cells (MSCs) represent a considerable candidate for cell therapy due to being easily obtained from a bone marrow aspiration and expanded to large number before transplantation, without ethical problems. In general, cell-based therapies have shown promising results for tissue regeneration using MSCs (5). In addition, the use of MSCs for tissue and organ regeneration offers advantages because of the relative ease of collection using a simple bone marrow aspiration and by showing their potential to differentiate to 3 lineages of cells (6-10). Additionally, they can be easily cultured outside the body for several passages without losing their renewal (11). Mesenchymal stem cells are able to give rise to tissues of mesodermal origin, such as dentine, bone or periodontal ligament (12), and bone regenerative potential of MSCs have been evaluated in bone defects in animals (13, 14). The international society of cellular therapy defined mesenchymal stem cells as pluripotent cells (15) that are usually present in damaged tissue, and through cell-to-cell interactions, or by secreting proteins can repair the affected area andthe influence of MSCs on damaged areas (16, 17). Some studies also suggested that MSCs lack certain receptors on their surface, which allows them to escape the T-cell component of the immunity system (18, 19). The MSCs also release biologically active molecules and many known mediators of tissue repair, such as VEGF, PDGF, bFGF, EGF, KGF, and TGF-β that influence cell migration, proliferation, and survival of the surrounding cells (20). Systemic transplantation of MSCs showed that the cells have the ability to migrate through the circulatory system and participate in regeneration of damaged tissue (21-23). In addition, injection of the cells to specific target tissues has shown that these cells contribute to the tissue cell phenotype (24-28). Autologous and none-autologous MSCs transplantation are considered as ideal procedures and may play a role in the clinical application of stem cells, particularly for bone defects, since they can be easily obtained without moral constraint and their presence and proliferation can be traced (29). This study aimed at evaluating the effect of bone marrow mesenchymal stem cells on the repair of bone defects in femur bone of rats and comparing autologous and non-autologous cell transplantation for repairing bone defects. Fifty-six male adult Wistar rats, weighting 200 ± 20 g, were maintained under standard laboratory conditions. Animals were housed in an environment of 21 ± 0.5°C with a relative humidity of 50 ± 10% and a 12-hour light-dark cycle. Food and water were always available. Rats were randomly divided to 4 equal groups (14 rats in each group) as follows: 1- Rats with bone defect and no treatment (control group), 2- Rats with bone defect and culture medium treatment (sham group), 3- Rats with bone defect and non-autologous MSCs transplantation (Experimental group 1), and 4- Rats with bone defect and autologous MSCs transplantation (Experimental group 2). Under sterile conditions, MSCs were obtained from bone marrow and harvested during anesthesia by aspiration to a syringe containing 1 mL of DMEM medium from the adult male rat femurs femoral of adult male Wistar rats. Approximately 1 mL of bone marrow was obtained and MSCs were isolated by adherence to the plastic surface of the culture plates. The MSCs were further cultured and expanded in alpha-minimum essential medium (MEM; Gibco), supplemented with 10% fetal bovine serum (FBS; Gibco), and 2% penicillin/streptomycin mixture (Pen/Strep, 10 000 IU/mL; Gibco), by incubation at 37°C in a 5-% CO2 atmosphere. On In the second day, the non-adherent cells were removed. The medium was replaced every 2 days with fresh medium and the cells were maintained in culture with cell passaging. Immunocytochemistry analysis was performed using CD44 and fibronectin markers to detect the MSCs. Medium was removed from plates, cells were washed in PBS, fixed with 4% paraformaldehyde and permeabilized with 0.1% Triton X-100. For investigations of protein expression, goat anti-rat CD44 and fibronectin antibody was used and incubated at 37°C for 12 hours with 5 mg/mL of the following monoclonal antibodies (Santa Cruz). The staining protocol was continued with secondary antibody binding (60 minutes), substrate addition, and hematoxylin counterstaining of the nuclei. The nuclei were counterstained with hematoxylin. The quantification assessment was performed using the Motic software with at least 5 randomly selected fields at 400X magnification and counting positive cells. Rats were anesthetized with 60 mg/kg ketamine hydrochloride and 10 mg/kg xylazine and a 2-cm longitudinal incision was caused in the middle third of the femur. The rat femur bone was exposed and a transcortical defect was created within the distal epiphyses of the femur bone using a drill sized 1 mm. After 3 days of injury, 2 × 105 cells/mL of Brdu labeled cells were suspended in DMEM medium and injected at the site of injury using an insulin syringe. All animals received 2,400,000 U of penicillin, Intramuscularly (IM) up to 6 days. Four weeks after cell transplantation, tissue sections prepared from the bone defect of rat femur were treated with polyclonal antibodies specific for BrdU. The implants were fixed overnight in 10% formaldehyde and decalcified for 7 days in 10% formic acid. The resulting specimens were paraffin embedded and sectioned at a thickness of 5 micrometers. Sections were de-paraffinized and rehydrated and washed with Phosphate Buffered Saline (PBS), and were then incubated with rat monoclonal anti-Brdu (1:100 dilution; Abcam) for 12 hours at 4°C, followed by Biotin and Avidin with HRP-conjugated anti-rat IgG for 1-hour. Specimens were colored by diaminobenzidine (DAB) as a substrate at room temperature. Sections were counterstained with Hematoxylin. The new bone formation occupying space within the bone defects was measured using an image analysis system coupled with a light microscope, and then the Brdu-labeled cells were counted at different microscopic fields. The effect of MSCs transplantation on the mechanical properties of healing bone was evaluated after 4 weeks of transplantation. Briefly, the animals were sacrificed and the femurs were harvested, wrapped in saline soaked gauze, and stored at -20°C until the time of testing. Prior to testing, the femurs were thawed at room temperature and kept moist in a saline solution. The proximal and distal ends of each femur were then placed in the grips of a hydraulically material testing machine (Zwick, Germany). The bones were tested at 3 points, bending until failure, at a constant angular displacement rate of 2 degrees per second. The stiffness and the breaking strength (Fmax) of the femur bones were tested for all groups. A = πr2 between groups were compared. Density (g/mm3): Density was obtained according to the following formula and was compared between groups. The obtained data were calculated and expressed as mean ± standard deviation (SD). One-way analysis of variance (ANOVA) was used for comparing the data in all groups. A significance level of 0.05 was predetermined for all statistical analyses. The MSCs were isolated from bone marrow and characterized as the expression of fibronectin and CD44 markers. Results from immunohistochemistry analysis showed that more than 93% and 95% of MSCs expressed these markers, respectively (Figure 1). Figure 1. Photomicrograph of Mesenchymal Cells After Immunocytochemistry. A - C, are Related to Fibronectin Antibody, CD44 and Negative Control Tests, Respectively. Fibronectin and CD44 Positive Cells in A and B Were Detected Due to DAB Stained Brown Color (Original Magnification, 400 ×). Immunohistochemical study of MSCs in the bone callus showed that in the cell therapy groups, which were previously labelled, MSCs were established and recognized in new bone and detected as brown cells. Hematoxylin staining was used as counter staining and the percentage of labeled cells and non-labeled cells were counted under a microscopic field (Figure 2). Figure 2. Photomicrograph of Labeled Cells in the Callus Tissue Sections of Non-Autologous (A) and Autologous (B) Stem Cell Transplantation (Magnification, 1000 ×). Continuous Arrows Show BrdU-Labeled Cells and Disrupted Arrows Show the Cells That Are Not Labeled for BrdU. Four weeks after transplantation of MSCs, biomechanical testing of the femur bones of rats showed that the average maximum bone strength (Fmax) versus bending force was 1.287 ± 0.0613 in the control group, 1.299 ± 0.0368 in the sham group, 1.95 ± 0.02 in the non-autologous and 1.56 ± 0.113 in the autologous group. No significant differences were shown in the mean Fmax between sham and control groups. The mean Fmax significantly increased in the autologous group compared with the control group (P < 0.05). However, the mean Fmax increased in non-autologous group compared with the control group yet this difference was not statistically significant (P = 0.07). Length: After 4 weeks, mean length of femur in the control group (34.6 ± 0.34) and sham group (36.7 ± 0.68) was not significantly different. In addition, mean length of femur in non-autologous (35.7 ± 0.47) and autologous (36.4 ± 0.43) groups showed no significant difference when compared with the control group (Figure 3). Figure 3. The Mean of the Length in Four Experimental Groups at Four Weeks After Transplantation Data is Showing Mean ± SD. Weight: The results of the samples showed the average mass of the control (0.68 ± 0.022) and sham groups (0.68 ± 0.045) were not significantly different but non-autologous (0.88 ± 0.027) and autologous (0.87 ± 0.06) groups showed significant increase compared with the control group (P < 0.05) (Figure 4). Figure 4. The Mean of Femoral Bone Mass at Four Weeks After Transplantation. Data Is Showing Mean ± SD. Area: The mean area of transverse section of tibia in control (3.5 ± 0.12), sham (3.6 ± 0.12), non-autologous (3.6 ± 0.07) and autologous (3.5 ± 0.10) groups showed no significant differences among the groups in this regard (Figure 5). Figure 5. The Average Size of Tibia at Four Weeks After Transplantation. Data Is Showing Mean ± SD. Density: evaluating the mean of bone density indicated no significant difference between the control (0.005 ± 0.0001) and sham (0.005 ± 0.0001) groups, yet the mean density in the non-autologous group (0.007 ± 0.0002) and autologous group (0.006 ± 0.0004) was significantly increased compared with the control group (P = 0.001 and P = 0.013) (Figure 6). Figure 6. The Average Size of Experimental Groups at Four Weeks After Transplantation. Data Is Showing As Mean ± SD. Stem-cell-based therapies have been a promising alternative for bone regeneration. Selection of appropriate donor cell types plays an important role in successful cell transplantation. Mesenchymal stem cells are of great interest, because they are a suitable source of osteogenic precursors, which may be used in both cell therapy and tissue engineering applications. Many studies expanding MSCs in vitro could enhance bone formation by increasing the quantity of the cells (30, 31). Osteo-progenitor cells derived from MSCs have been expanded in tissue culture-formed corticocancellous bone when transplanted to animal models (32-38). In utero transplantation of the cells, contribution of the cells in bone formation of the recipient animals has been indicated (39-41). This study was designed to perform a morphological evaluation of MSC transplantation in femur bone healing and to compare non-autologous and autologous cell transplantation effects on bone regeneration and improvement of mean mass, length, area, and density parameters. The current results showed that autologous and non-autologous cell transplantation had no significant effect on length and area of the repaired femur bone, yet the mass and density of the injected groups had a significant difference in comparison with the control and sham groups. The results of the current study were compatible with previous findings. Li et al. transplanted bone marrow-derived MSCs to treatment mouse with osteoporosis imperfecta (OI), which had a significant effect on bone regeneration, and transplanted cells differentiated into osteoblasts in vivo and contributed to new bone formation (42). In agreement with the results of Li and Wang, in the current study it was shown that MSCs contribute to bone cell phenotype and bone formation in osteogenesis imperfecta bones (OI). The MSCs were marked with GFP and it was shown that transplanted cells differentiated to osteoblasts and contributed to bone formation in vivo (38). In addition, Horwitz et al. transplanted non-autologous stromal stem cells to children with osteogenesis imperfecta; 3 months after treatment, they found high bone density, and reduced fracture rate (40). Also, Kon et al. also revealed the ability of marrow-derived osteoprogenitor cells to promote repair of critical-size tibial gaps upon autologous transplantation in a sheep model. The current biomechanical results at 4 weeks after autologous and non-autologous MSCs transplantation showed the average maximum mechanical strength of bone against force to break increased in both cell transplanted groups, yet the increase was significant in comparison with non-transplanted groups only in theautologous group, and the non-autologous group did not show a statistically significant difference (P = 0.07). These results showed that MSC transplantation could induce regeneration in damaged femur bone and could improve some histomorphometric and biomechanical properties of regenerating bone. Although results were comparable between non-autologous and autologous groups, autologous cell transplantation showed a greater improvement effect, especially in regards to mechanical strength of the bone. Shin et al. also compared the autologous group of stromal cells in the distal femur of demineralized dogs without a cell treatment with allograft transplantation, and it was shown that bone matrix demineralized dog (PDBM) without cells and untreated group showed a significant increase; these results are in agreement with the findings of the current study. Increase in bone strength in groups that were under cell therapy in the above study and the current research was because of increased accelerationinduced in bone formation anda more complete healing (43). In contrast of the current results, other studies on goats and sheep showed that resistance of bone 8 and 32 weeks after cell therapy was significantly increased compared to controls (44). It seems that the function of stem cells in bone regeneration is due to their differentiation in osteoblasts, which can produce the extracellular matrix, and secret bone-specific proteins and cytokines to enhance new bone formation. On the other hand, transplanted cells stimulated endogenous cells for repairing through interaction with the cellular matrix. In addition, they produced growth factors and other factors, such TGF-β. However, these cells could secrete a large amount of cytokines, which play an essential role in repair and activate osteogenesis at sites of damage (45). The current results showed that autologous cell transplantation was more effective in comparison with non-autologous transplantation, which could explain why autologous cell transplantation had a lower risk of rejection and transplanted cells appeared easily in damaged tissue (REF) (46). In conclusion, the current results showed that mesenchymal stem cells could promote the regeneration of injured bone and improve morphometric and mechanical parameters of rat femur bone. The authors acknowledge Baqiyatallah University of Medical Sciences for supporting this study. 1. Sandberg MM, Aro HT, Vuorio EI. Gene expression during bone repair. Clin Orthop Relat Res. 1993;(289):292-312. [PubMed: 8472429]. 2. Iwasaki M, Le AX, Helms JA. Expression of indian hedgehog, bone morphogenetic protein 6 and gli during skeletal morphogenesis. Mech Dev. 1997;69(1-2):197-202. [PubMed: 9486541]. 3. Caplan AI. Mesenchymal stem cells. J Orthop Res. 1991;9(5):641-50. doi: 10.1002/jor.1100090504. [PubMed: 1870029]. 4. Scadden DT. The stem-cell niche as an entity of action. Nature. 2006;441(7097):1075-9. doi: 10.1038/nature04957. [PubMed: 16810242]. 5. Pagni G, Kaigler D, Rasperini G, Avila-Ortiz G, Bartel R, Giannobile WV. Bone repair cells for craniofacial regeneration. Adv Drug Deliv Rev. 2012;64(12):1310-9. doi: 10.1016/j.addr.2012.03.005. [PubMed: 22433781]. 6. Munoz-Elias G, Marcus AJ, Coyne TM, Woodbury D, Black IB. Adult bone marrow stromal cells in the embryonic brain: engraftment, migration, differentiation, and long-term survival. J Neurosci. 2004;24(19):4585-95. doi: 10.1523/JNEUROSCI.5060-03.2004. [PubMed: 15140930]. 7. Suzuki H, Taguchi T, Tanaka H, Kataoka H, Li Z, Muramatsu K, et al. Neurospheres induced from bone marrow stromal cells are multipotent for differentiation into neuron, astrocyte, and oligodendrocyte phenotypes. Biochem Biophys Res Commun. 2004;322(3):918-22. doi: 10.1016/j.bbrc.2004.07.201. [PubMed: 15336551]. 8. Hermann A, Liebau S, Gastl R, Fickert S, Habisch HJ, Fiedler J, et al. Comparative analysis of neuroectodermal differentiation capacity of human bone marrow stromal cells using various conversion protocols. J Neurosci Res. 2006;83(8):1502-14. doi: 10.1002/jnr.20840. [PubMed: 16612831]. 9. Lu J, Moochhala S, Moore XL, Ng KC, Tan MH, Lee LK, et al. Adult bone marrow cells differentiate into neural phenotypes and improve functional recovery in rats following traumatic brain injury. Neurosci Lett. 2006;398(1-2):12-7. doi: 10.1016/j.neulet.2005.12.053. [PubMed: 16455199]. 10. Cao Q, Ding P, Lu J, Dheen ST, Moochhala S, Ling EA. 2', 3'-Cyclic nucleotide 3'-phosphodiesterase cells derived from transplanted marrow stromal cells and host tissue contribute to perineurial compartment formation in injured rat spinal cord. J Neurosci Res. 2007;85(1):116-30. doi: 10.1002/jnr.21092. [PubMed: 17061258]. 11. Maxson S, Lopez EA, Yoo D, Danilkovitch-Miagkova A, Leroux MA. Concise review: role of mesenchymal stem cells in wound repair. Stem Cells Transl Med. 2012;1(2):142-9. doi: 10.5966/sctm.2011-0018. [PubMed: 23197761]. 12. Pevsner-Fischer M, Levin S, Zipori D. The origins of mesenchymal stromal cell heterogeneity. Stem Cell Rev. 2011;7(3):560-8. doi: 10.1007/s12015-011-9229-7. [PubMed: 21437576]. 13. Friedenstein AJ, Chailakhjan RK, Lalykina KS. The development of fibroblast colonies in monolayer cultures of guinea-pig bone marrow and spleen cells. Cell Tissue Kinet. 1970;3(4):393-403. [PubMed: 5523063]. 14. Brooke G, Cook M, Blair C, Han R, Heazlewood C, Jones B, et al. Therapeutic applications of mesenchymal stromal cells. Semin Cell Dev Biol. 2007;18(6):846-58. doi: 10.1016/j.semcdb.2007.09.012. [PubMed: 18024097]. 15. Djouad F, Mrugala D, Noel D, Jorgensen C. Engineered mesenchymal stem cells for cartilage repair. Regen Med. 2006;1(4):529-37. doi: 10.2217/17460751.1.4.529. [PubMed: 17465847]. 16. Correia SI, Pereira H, Silva-Correia J, Van Dijk CN, Espregueira-Mendes J, Oliveira JM, et al. Current concepts: tissue engineering and regenerative medicine applications in the ankle joint. J R Soc Interface. 2014;11(92):20130784. doi: 10.1098/rsif.2013.0784. [PubMed: 24352667]. 17. Chung R, Foster BK, Xian CJ. Preclinical studies on mesenchymal stem cell-based therapy for growth plate cartilage injury repair. Stem Cells Int. 2011;2011:570125. doi: 10.4061/2011/570125. [PubMed: 21808649]. 18. Pittenger MF, Mackay AM, Beck SC, Jaiswal RK, Douglas R, Mosca JD, et al. Multilineage potential of adult human mesenchymal stem cells. Science. 1999;284(5411):143-7. [PubMed: 10102814]. 19. Devine MJ, Mierisch CM, Jang E, Anderson PC, Balian G. Transplanted bone marrow cells localize to fracture callus in a mouse model. J Orthopaed Res. 2002;20(6):1232-9. doi: 10.1016/s0736-0266(02)00051-7. 20. Gnecchi M, Zhang Z, Ni A, Dzau VJ. Paracrine mechanisms in adult stem cell signaling and therapy. Circ Res. 2008;103(11):1204-19. doi: 10.1161/CIRCRESAHA.108.176826. [PubMed: 19028920]. 21. Li F, Wang X, Niyibizi C. Distribution of single-cell expanded marrow derived progenitors in a developing mouse model of osteogenesis imperfecta following systemic transplantation. Stem Cells. 2007;25(12):3183-93. doi: 10.1634/stemcells.2007-0466. [PubMed: 17823236]. 22. Wang X, Li F, Niyibizi C. Progenitors systemically transplanted into neonatal mice localize to areas of active bone formation in vivo: implications of cell therapy for skeletal diseases. Stem Cells. 2006;24(8):1869-78. doi: 10.1634/stemcells.2005-0430. [PubMed: 16675597]. 23. Niyibizi C, Wang S, Mi Z, Robbins PD. The fate of mesenchymal stem cells transplanted into immunocompetent neonatal mice: implications for skeletal gene therapy via stem cells. Mol Ther. 2004;9(6):955-63. doi: 10.1016/j.ymthe.2004.02.022. [PubMed: 15194062]. 24. Yoon YS, Wecker A, Heyd L, Park JS, Tkebuchava T, Kusano K, et al. Clonally expanded novel multipotent stem cells from human bone marrow regenerate myocardium after myocardial infarction. J Clin Invest. 2005;115(2):326-38. doi: 10.1172/JCI22326. [PubMed: 15690083]. 25. Peterson B, Zhang J, Iglesias R, Kabo M, Hedrick M, Benhaim P, et al. Healing of critically sized femoral defects, using genetically modified mesenchymal stem cells from human adipose tissue. Tissue Eng. 2005;11(1-2):120-9. doi: 10.1089/ten.2005.11.120. [PubMed: 15738667]. 26. Satoh H, Kishi K, Tanaka T, Kubota Y, Nakajima T, Akasaka Y, et al. Transplanted mesenchymal stem cells are effective for skin regeneration in acute cutaneous wounds. Cell Transplant. 2004;13(4):405-12. [PubMed: 15468682]. 27. Lendeckel S, Jodicke A, Christophis P, Heidinger K, Wolff J, Fraser JK, et al. Autologous stem cells (adipose) and fibrin glue used to treat widespread traumatic calvarial defects: case report. J Craniomaxillofac Surg. 2004;32(6):370-3. doi: 10.1016/j.jcms.2004.06.002. [PubMed: 15555520]. 28. De Bari C, Dell'Accio F, Vandenabeele F, Vermeesch JR, Raymackers JM, Luyten FP. Skeletal muscle repair by adult human mesenchymal stem cells from synovial membrane. J Cell Biol. 2003;160(6):909-18. doi: 10.1083/jcb.200212064. [PubMed: 12629053]. 29. Liu Y, Liu Y, Wang P, Tian H, Ai J, Liu Y, et al. Autologous bone marrow stem cell transplantation for the treatment of postoperative hand infection with a skin defect in diabetes mellitus: A case report. Oncol Lett. 2014;7(6):1857-62. doi: 10.3892/ol.2014.1998. [PubMed: 24932248]. 30. Kon E, Muraglia A, Corsi A, Bianco P, Marcacci M, Martin I, et al. Autologous bone marrow stromal cells loaded onto porous hydroxyapatite ceramic accelerate bone repair in critical-size defects of sheep long bones. J Biomed Mater Res. 2000;49(3):328-37. [PubMed: 10602065]. 31. Quarto R, Mastrogiacomo M, Cancedda R, Kutepov SM, Mukhachev V, Lavroukov A, et al. Repair of large bone defects with the use of autologous bone marrow stromal cells. N Engl J Med. 2001;344(5):385-6. doi: 10.1056/NEJM200102013440516. [PubMed: 11195802]. 32. Krebsbach PH, Mankani MH, Satomura K, Kuznetsov SA, Robey PG. Repair of craniotomy defects using bone marrow stromal cells. Transplantation. 1998;66(10):1272-8. [PubMed: 9846508]. 33. Krebsbach PH, Kuznetsov SA, Satomura K, Emmons RV, Rowe DW, Robey PG. Bone formation in vivo: comparison of osteogenesis by transplanted mouse and human marrow stromal fibroblasts. Transplantation. 1997;63(8):1059-69. [PubMed: 9133465]. 34. Kuznetsov SA, Krebsbach PH, Satomura K, Kerr J, Riminucci M, Benayahu D, et al. Single-colony derived strains of human marrow stromal fibroblasts form bone after transplantation in vivo. J Bone Miner Res. 1997;12(9):1335-47. doi: 10.1359/jbmr.1997.12.9.1335. [PubMed: 9286749]. 35. Kuznetsov SA, Mankani MH, Robey PG. Effect of serum on human bone marrow stromal cells: ex vivo expansion and in vivo bone formation. Transplantation. 2000;70(12):1780-7. [PubMed: 11152111]. 36. Mankani MH, Krebsbach PH, Satomura K, Kuznetsov SA, Hoyt R, Robey PG. Pedicled bone flap formation using transplanted bone marrow stromal cells. Arch Surg. 2001;136(3):263-70. [PubMed: 11231843]. 37. Mankani MH, Kuznetsov SA, Fowler B, Kingman A, Robey PG. In vivo bone formation by human bone marrow stromal cells: effect of carrier particle size and shape. Biotechnol Bioeng. 2001;72(1):96-107. [PubMed: 11084599]. 38. Mankani MH, Kuznetsov SA, Avila NA, Kingman A, Robey PG. Bone formation in transplants of human bone marrow stromal cells and hydroxyapatite-tricalcium phosphate: prediction with quantitative CT in mice. Radiology. 2004;230(2):369-76. doi: 10.1148/radiol.2302011529. [PubMed: 14752182]. 39. Horwitz EM, Prockop DJ, Fitzpatrick LA, Koo WW, Gordon PL, Neel M, et al. Transplantability and therapeutic effects of bone marrow-derived mesenchymal cells in children with osteogenesis imperfecta. Nat Med. 1999;5(3):309-13. doi: 10.1038/6529. [PubMed: 10086387]. 40. Guillot PV, Abass O, Bassett JH, Shefelbine SJ, Bou-Gharios G, Chan J, et al. Intrauterine transplantation of human fetal mesenchymal stem cells from first-trimester blood repairs bone and reduces fractures in osteogenesis imperfecta mice. Blood. 2008;111(3):1717-25. doi: 10.1182/blood-2007-08-105809. [PubMed: 17967940]. 41. Panaroni C, Gioia R, Lupi A, Besio R, Goldstein SA, Kreider J, et al. In utero transplantation of adult bone marrow decreases perinatal lethality and rescues the bone phenotype in the knockin murine model for classical, dominant osteogenesis imperfecta. Blood. 2009;114(2):459-68. doi: 10.1182/blood-2008-12-195859. [PubMed: 19414862]. 42. Li B, Boast S, de los Santos K, Schieren I, Quiroz M, Teitelbaum SL, et al. Mice deficient in Abl are osteoporotic and have defects in osteoblast maturation. Nat Genet. 2000;24(3):304-8. doi: 10.1038/73542. [PubMed: 10700189]. 43. Shih HN, Shih LY, Sung TH, Chang YC. Restoration of bone defect and enhancement of bone ingrowth using partially demineralized bone matrix and marrow stromal cells. J Orthop Res. 2005;23(6):1293-9. doi: 10.1016/j.orthres.2005.04.005.1100230609. [PubMed: 15946821]. 44. Liu G, Zhao L, Zhang W, Cui L, Liu W, Cao Y. 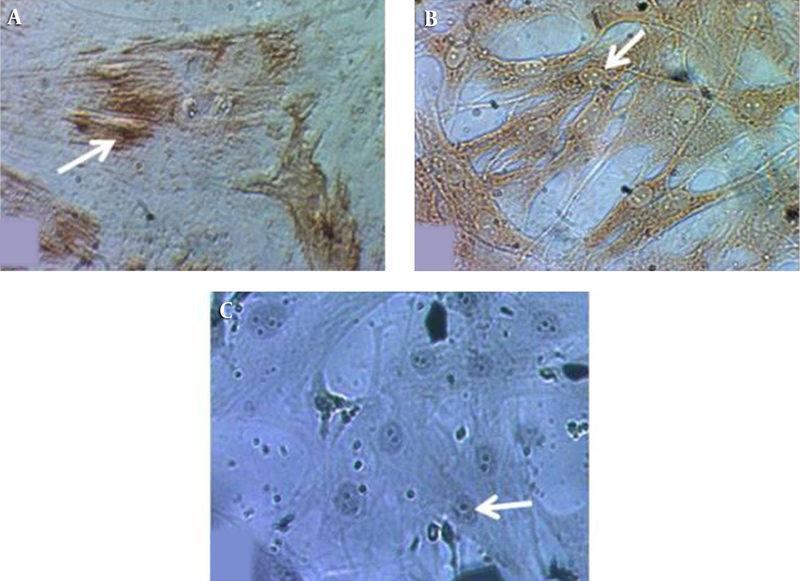 Repair of goat tibial defects with bone marrow stromal cells and beta-tricalcium phosphate. J Mater Sci Mater Med. 2008;19(6):2367-76. doi: 10.1007/s10856-007-3348-3. [PubMed: 18158615]. 45. Vaes BL, Ducy P, Sijbers AM, Hendriks JM, van Someren EP, de Jong NG, et al. Microarray analysis on Runx2-deficient mouse embryos reveals novel Runx2 functions and target genes during intramembranous and endochondral bone formation. Bone. 2006;39(4):724-38. doi: 10.1016/j.bone.2006.04.024. [PubMed: 16774856]. 46. Hipp J, Atala A. Tissue engineering, stem cells, cloning, and parthenogenesis: new paradigms for therapy. J Exp Clin Assist Reprod. 2004;1(1):3. doi: 10.1186/1743-1050-1-3. [PubMed: 15588286].